Now, as clearly explained on my contact page, there are a lot of websites built using my template designs – and I can never answer for any single one of them. I can answer any question related to andreasviklund.com, and to the original template designs. But expecting me to assume responsibility for what people unknown to me do, only because they have used one of my templates at some point, it way out of bounds. After a brief exchange of messages on Twitter, I recieved a deadline. I have been given 24 hours to comply with the demands of The Waiting Room, despite several attempts to explain that I am not able to help and that I am the wrong person to contact. Since I did not get any further explanation of what will happen after this deadline passes, I will have to consider it a threat – and I do not accept being threatened when I have done nothing wrong. It is simply unacceptable, and it forces me to write this post to make sure that my friends and readers know what is currently happening. I deal with misunderstandings like this every week, without having to go public with the stories. So far I have always managed to sort out the misunderstanding. At one point, I had to write a blog post to get my point through (“The curse of a free website template designer”) – but in this case and at this point the situation is currently not sorted out. I will update this entry when needed. Until then, you can follow the discussions on my Twitter feed. 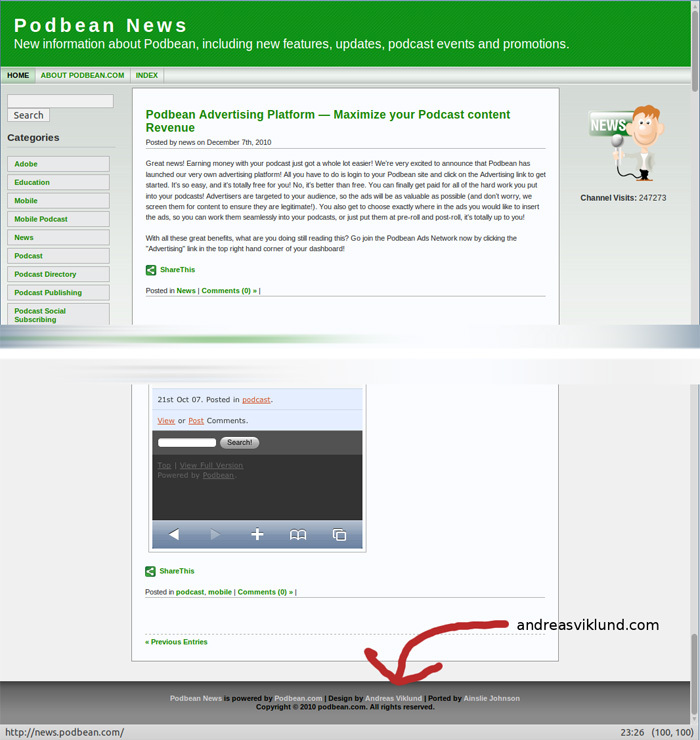 Update: I have now confirmed that the news blog which connects me to Podbean is using Ainslie Johnson’s WP-Andreas09 theme for WordPress. Its design was originally based on the andreas09 template, and as mentioned in a previous post the theme is used on hundreds of thousands of blogs and websites all over the world. The Podbean news blog is one of those blogs, and it makes my point very valid. I can answer for any question related to the original andreas09 CSS template design, but expecting me to take responsibility for the actions of the owner of a random website that uses a WordPress theme version of the template, that is simply not right. It is quite apparent that this “waiting room” is located outside an emergency psychiatrist’s office and someone has been reading old magazines for way too long. I admire your angelical patience with the terminally stupid, I’d just troll the living daylights out of them, if I could be bothered to respond at all. Apparently, the people at Podbean have grown tired of this particularly putrid little troll and stopped feeding him. I can’t say I blame them. This is a common misunderstanding, which in most cases are sorted out by a few exchanges of messages. I won’t use any harsh words, but when I try to explain what is wrong with assuming that I can answer for other peoples content or actions and I get threats in return, the situation needs to be brought out into visibility. If the reaction from the public doesn’t help, then I will be happy to hand over the discussion to legal representatives. But since I started publishing free website templates back in the summer of 2005, I have never needed to do that. I do believe in common sense, so I do not expect this situation to go that far. But yes, this is an awful waste of time and energy. And it is a shame that it has to be handled in public. Not for me or for this website, but I simply do not want people to be upset about my work. As long as a situation like this is not sorted out, it does look bad for the part which is leaving the common sense out. It’s sad that some people can act this way, speak in such language, and expect people to comply with their ridiculous demands. It is not the world’s problem if a contract is not being followed. If that is the case, this person should contact a lawyer, not a (completely unrelated) open source web designer. I hope this gets resolved. Well, now that you have in turn linked to them from this site, they are obviously part of the conspiracy. So, you can just forward the complaint to The Waiting Room; problem solved! What they are doing is harassing you. You should tell Twitter and get them to shut them down. This example just goes to show that life can be even more absurd than a Monty Python joke. I admire your patience. They obviously have assumed that “designed by” is the equivalent of “content created by”. If you haven’t pointed that out with them, it might be worth your time to state that fact. It also might be worth looking to reword your tagline to something like “based upon a web site template by Andreas Viklund”. I have much respect for you and are much appreciative of the work that you do. I am sorry for the waste of your time and energy in this matter, and truly hope that cooler (and logical) heads prevail in this matter (if they haven’t done so already). That being said, I wanted to express my personal thanks for your service. I am not a web designer, by trade. Never has a class in such passed through my existence. Learning all of the ins and outs is harder than one would think. I am currently working with a couple of your templates – andreas00 and andreas02 – to work on my current project at someth.in – and will ensure, as you politely asked, to have your credit on the bottom. The site is nowhere near finished, and there are links all over the prematurely posted few pages that will come back to your site, but it will get cleaned up straightway. I just hope that nothing I do angers the masses enough to ridiculously send you any kind of legal harassment in the form of email, letter, phone call, or otherwise. Thanks again, and I wish you the best in your endeavors!